While it's rare to see a phoenix outside a Harry Potter movie today, Phoenix used to be an important Egyptian zodiac sign. It's association with death and rebirth makes it fitting to be our last Egyptian zodiac sign. Characteristics of the Egyptian Zodiac Sign Phoenix: If your sign is Phoenix, you take full advantage of all opportunities that come your way. Doing so allows you to always find success, even when it seems there's no hope. You are filled with optimism and care a great deal about others, but can also isolate yourself and live in dreams, not wanting to face reality. You erect a shell around yourself that can be quite hard to break free from, but with your love for challenges, you can do so whenever you set your mind to it. 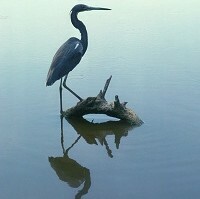 About the Phoenix: The Ancient Egyptians usually used a large, grey heron to symbolize the phoenix (see image above). They believed the phoenix was connected to the sun god, Ra, and often used the heron's hieroglyph to symbolize Ra. The connection to Ra also made the phoenix the symbol of the rising and setting sun. The phoenix was the first creature created and it's call marked the beginning of time. This made the phoenix the god of time and birth. It is thought that when a phoenix dies, it builds a nest of twigs in which it lays down and dies. A small worm emerges and is transformed into a phoenix when the sun's rays hit it. The phoenix became an Egyptian zodiac sign under Greek rule because it was able to be associated with the Greek sun-god, Apollo.